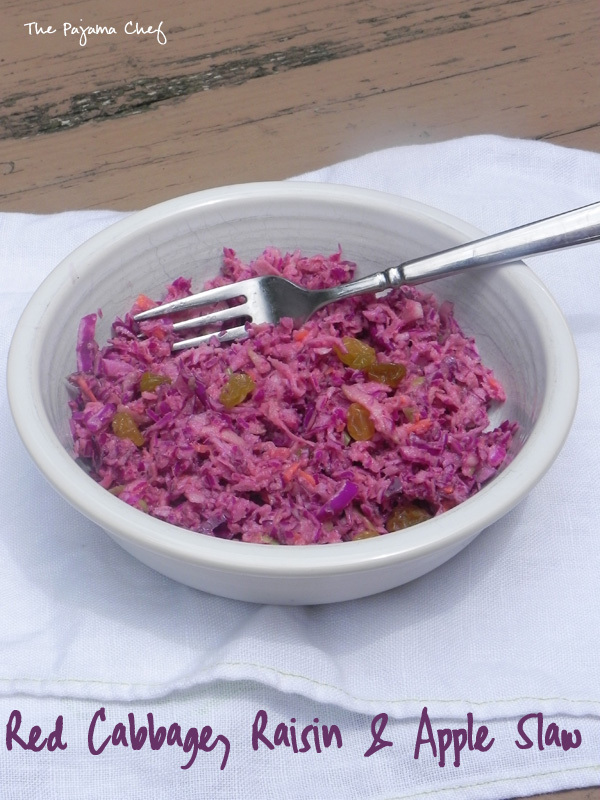 This easy red cabbage slaw is sweet and crunchy, bursting with raisins, apples, and carrots. It’s creamy and tangy so everyone will love it! I don’t really like the word “slaw.” Or the words “cole slaw.” It just sounds… unappetizing to me. But when you need a cold veggie side dish for summer picnics or barbecue pork, or just a normal weeknight dinner, it’s just really the best choice. You can make it ahead and it’s good in the fridge for up to a week too! And this slaw [shudder!] tastes really, really, really good. So that helps too. 🙂 I’m so picky about cole slaw, besides the name. The taste is super important to me. I don’t like it to be too creamy [like my dad prefers] or too vinegary… but rather, something in the middle. Like this recipe! 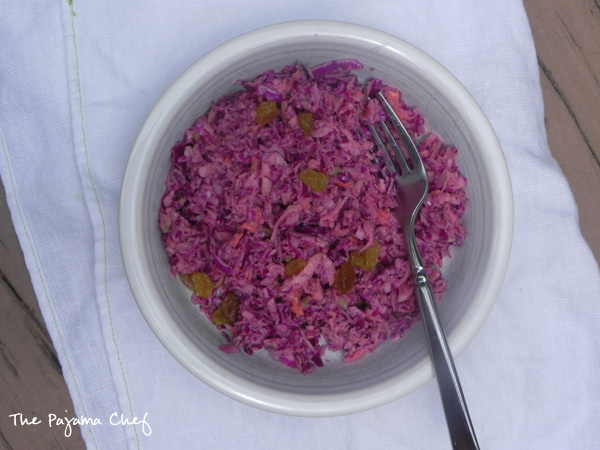 The dressing for this red cabbage based slaw is creamy AND tangy. I used mayo, Greek yogurt, and sour cream for optimal creaminess along with a hint of apple cider vinegar and lemon juice for tang. Perfect! Besides the taste of the dressing, a great slaw to me has to have some sweet elements. The more the merrier, I think! This slaw also features raisins and apples and carrots for tons of sweetness. The perfect blend. 🙂 My slaw isn’t quite as pretty as traditional cole slaws because the holes of my circa-1980 food processor are kinda wonky, so if you take the time to slice a head of cabbage your slaw will look MUCH better than mine. Take a look at the original recipe and you’ll see what I mean. But looks aside, this slaw is fantastic and is sure to be a staple in my home for many summers to come. Enjoy! Happy Labor Day weekend! In a small bowl, whisk together mayo, yogurt, vinegar, lemon juice, honey, and pepper for the dressing. Set aside. Use a food processor or a sharp knife to shred the cabbage into thin strips and place in a large bowl. Grate carrots and apple, then toss with cabbage. Pour dressing over vegetables, then gently toss until combined. Slaw is best within the first day or so, but lasts in the fridge up to one week. 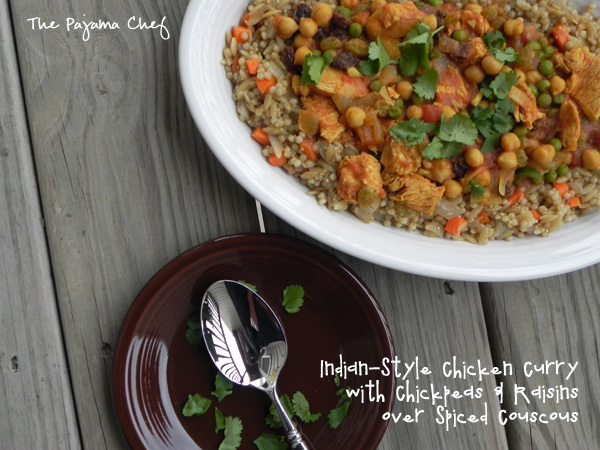 Fragrant, rich chicken and chickpea curry incorporates great flavors to make an amazing dish! Serve it over spiced couscous for a special treat. On with the recipe though! Have you ever heard of Jhumpa Lahir’s Interpreter of Maladies? I had not, and was surprised when I picked up a copy at my local library. It’s actually a collection of short stories centering on the themes of family, home, marriage, belonging, and more. Many take place in America, but I thought some of the most interesting stories were set in India. You don’t think about adaptations to new life in your own country… this book is just lovely! The first and last stories were my favorites, but they are all good. Have you read this book before? If not, you should pick it up! I highly recommend it. Food is an integral part to all of the stories, and nearly each one mentioned curry! An Indian classic for sure, with as many variations as there are people. One of the recipes Camilla chose for us to make this month was a hard boiled egg curry. It sounds SO interesting. 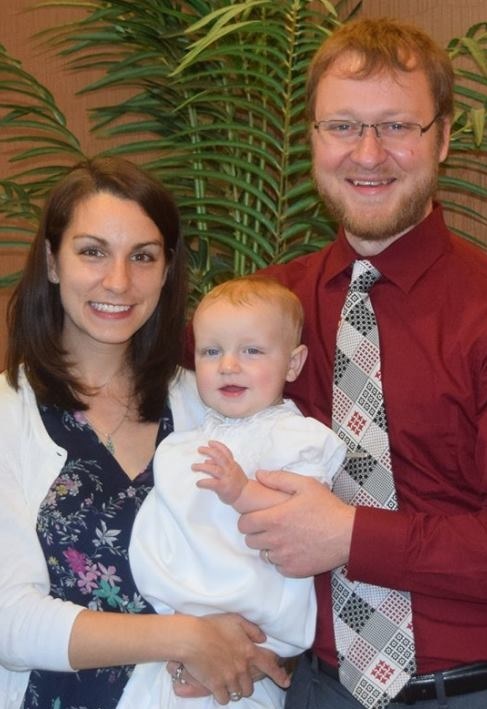 But Ben hates hard boiled eggs with a passion, so that’s a no go for us [and I don’t think I could eat a whole batch alone]. Instead, chicken curry it is! This is one of my very favorite curry recipes, and actually is the one that made me love Indian food! Ben and I have made this recipe a handful time over the past few years… it is absolutely delightful each time! Every bite is rich and flavorful, and your kitchen will smell absolutely wonderful while you’re cooking. Ginger! Garlic! Garam masala! Mmm, mmm, mmm. 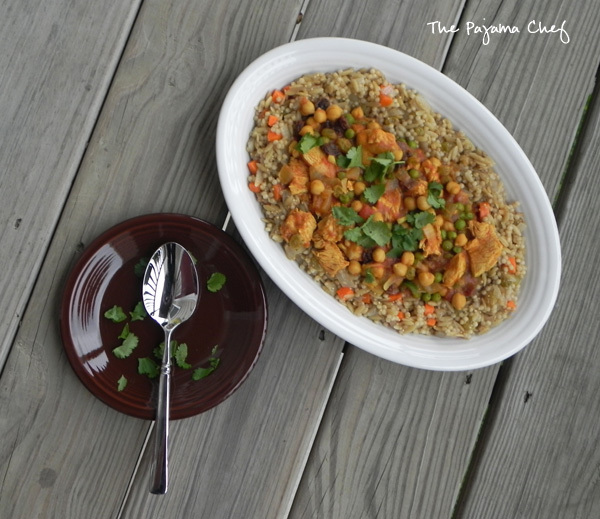 The tomato and coconut based curry sauce is fabulous over the chicken and chickpeas and plump, juicy raisins… and the flavors are magnified since it’s not just served over regular ‘ole rice, but instead over a spiced couscous that is just bursting with more raisins and rich spices. Yes, it’s a lengthy recipe with quite a few ingredients… BUT it is oh-so-good. A great dish for company, a great dish to make on a relaxing night at home. It’s just as fantastic as anything you could get at a restaurant, but easy to make at home with accessible ingredients too. Make it this weekend! 🙂 Enjoy! And oh! 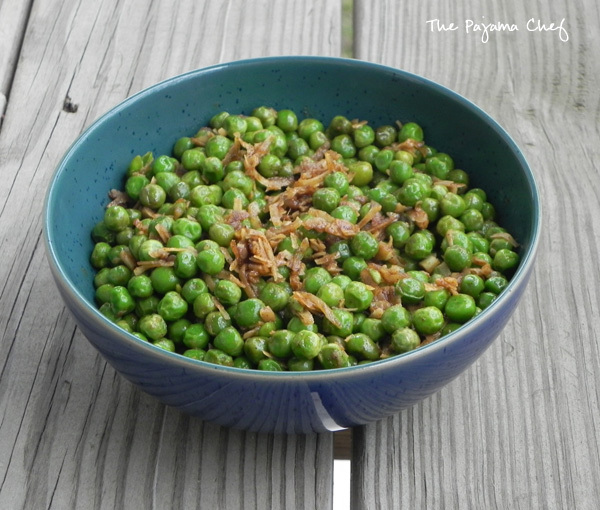 If you’re looking for an easy side dish to serve with this, try these easy Indian-spiced peas. No real recipe… just mix together a teaspoon or two of coconut oil, a 10 ounce bag of frozen peas, and a teaspoon each of curry powder and garam masala in a skillet. Cook over low heat until hot, then mix in a about a 1/4 cup of coconut flakes. Ahhhmazing! Next time I might toast the coconut to make it even better. Yum! 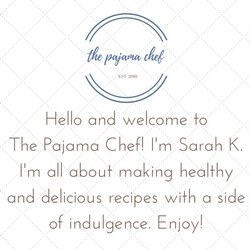 from Jenna’s Everything Blog – go to either post for great step by step photos if that’s your thing! Set a small skillet over medium heat. Pour in curry powder and garam masala, then stir constantly for about 1-2 minutes to toast spices, until fragrant. Remove from heat and transfer to a bowl. In a Dutch oven or other large pot, heat 3 tablespoons oil over medium high heat. When hot, add onions and season with salt. Stirring occasionally, cook for about 15 minutes until onions are browned and caramelized. If you have you more time, cook the onions on medium-low heat for a longer amount of time to caramelize them more. But either way works! After onions are cooked to your liking, add garlic, ginger, and chili pepper. Stir and cook for about a minute, then add in toasted spices and tomato paste. Pour in the chicken broth and crushed tomatoes, stirring to mix everything up. Add chickpeas, chicken, and raisins. Make sure the chicken is submerged as much as possible. Bring to a simmer, then cover and reduce heat to medium-low. Simmer for about 15 minutes, until chicken is just about done. Meanwhile, prepare couscous while chicken is cooking. In a saucepan, heat oil over medium heat. Add diced onion and cook for about 5-6 minutes, until soft. Stir in garam masala, cooking for about 30 seconds until fragrant. Add chicken broth, butter, and raisins. Stir and bring to a boil. Add couscous [or other grain], bring to a boil again, and cook for about 10-15 minutes until fully cooked. Liquid should be absorbed but exact time depends on what grains you use. Season to taste with salt or additional garam masala then set aside to serve with curry. When chicken is fully cooked, remove to cutting board and chop it up into bite-sized pieces. If the chicken isn’t fully cooked, it will finish cooking in the sauce. Return chicken to pot, then stir in coconut milk and peas [if using]. Cook for about 5 minutes, then add in half of the cilantro. Serve curry over couscous, with additional cilantro on top. Enjoy! This simple corn salad has a pop of sweetness, a little cheese, and lots of yum. One bite and you’ll be hooked! 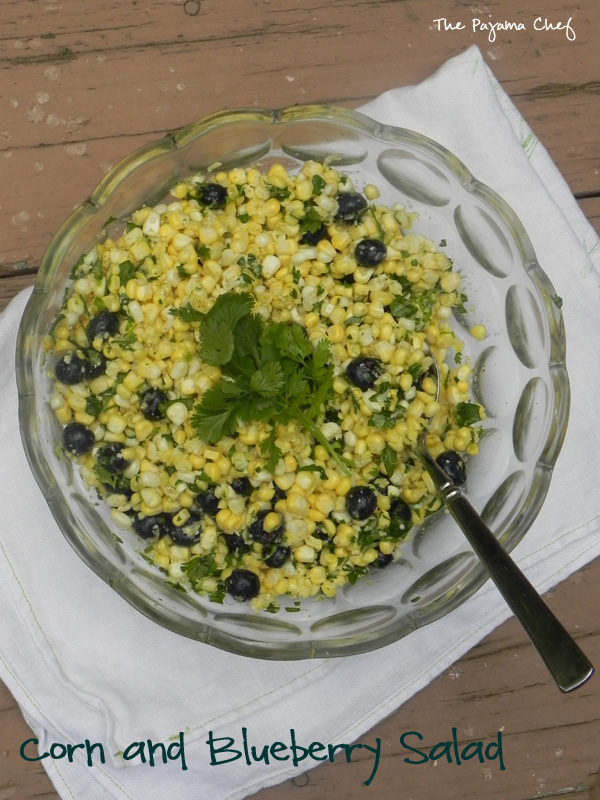 You’re going to LOVE this amazingly flavorful Corn and Blueberry Salad. The best of summer, right here! This salad is a guaranteed hit… and it takes just a few minutes to throw together and uses ONLY seven ingredients! What’s not to love? I shared the recipe on Thriving Home, so check it out now! Enjoy!